Connor McDavid is fortunate that Sidney Crosby missed the first six games of the season. It likely secured a scoring title for the Edmonton Oilers captain. Make no mistake, McDavid is earning his keep atop the NHL leaderboard, but Crosby leads the league in points per game by a country mile, and mathematically he would probably be in first place had he played the same amount of games as McDavid. But you need luck sometimes, and Connor continues to remain a step ahead in the race. However, the Penguins captain isn’t the only guy he has to fight off to win his first Art Ross Trophy. 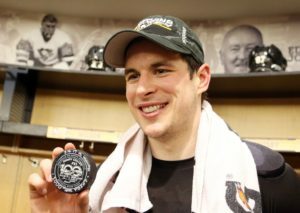 We already know about Crosby, who just notched his 1,000th NHL point. It’s quite a feat considering he’s only played in 757 games. In fact, he became the 12th fastest player in NHL history to reach the milestone. He’s going to be in the conversation for the Art Ross despite the games missed, though they put him at a disadvantage. Crosby and McDavid aren’t the only great players in this race, and you could argue that there are at least eight different players in contention. The interesting thing is that Crosby’s teammate Evgeni Malkin might also have been the leader had he not missed time to injury. Malkin has 24 goals and 58 points in just 49 games, and is playing like a man possessed. Don’t be surprised if he’s neck and neck with McDavid at the end of the season. When Joe Thornton called Brent Burns the best player in the world we all chuckled. It was a nice sentiment from a teammate, but obviously a little far-fetched, right? Well don’t look now, but Burns (a defenceman no less), is sitting in third place with 61 points. He has 25 goals to go with it. Burns has been steadily rising to one of the best d-men in the league for a few years now, but he’s now emerging as one of the better players. Brent Burns is the best player in the world right now, easily. Sidney who???? Better than Crosby? Probably not. But the league’s best defenceman? You could make the case. For years, when it came to Norris Trophy voting, voters looked at point totals when evaluating which blueliner was the best, to the dismay of many puritans of the game. Some believe the most important evaluation of a defenceman is his play in the defensive zone, and without the puck. There’s no problem there with Burns. He’s a +20 on the season, he plays upwards of 25 minutes on most nights, and he’s always on the ice in important situations. He’s garnering Hart Trophy talk, especially considering his Sharks are first in the Pacific Division. It’s hard to get a lot of attention when you play on the same team as Alex Ovechkin. But Nicklas Backstrom has quietly been one of the best centermen in the league for years now. And he’s not a product of Ovechkin. Wingers normally don’t make their centers better. It’s usually the other way around. Ovechkin is a fantastic goal scorer, but he isn’t the kind of player who elevates all the other guys on the ice. Backstrom on the other hand is a superb play-maker, he sees the ice extremely well and makes great decisions. He may be the most underrated superstar in the league. He’s not a one-year wonder either. Backstrom has scored 70 points or more the past three seasons running. He also finished fourth in league scoring back in the 2009-10 season with a whopping 101 points. Nicklas Backstrom with 60 points in 57 GP this year for WSH. Last year: 70 points in 75 games. Amazing career, 702 pts in 708 career games. Unfortunately for Brad Marchand, his self-imposed reputation for being a dirty player has clouded the fact that he’s actually quite talented. He has a nose for the net (no pun intended), he’s fast, he’s shifty and he comes through in the clutch. Marchand finished last season with 61 points, and will easily beat that this year. His career high in goals (37) came last season. He now sits at 24, and has a good chance to hit the 30-goal plateau for just the second time in his career. If he would quit all the nasty hits and just play hockey, he would garner a lot more respect for his skill. But it’s hard to separate the two, especially with some of his dirty work this season. You could make the point that the scoring title belongs to McDavid until it doesn’t. He’s been leading the league in points for most of the season, and every time someone else gets close, he pulls away. Think @cmcdavid97 knew Crosby took over the scoring lead earlier tonight? If McDavid can fend off the competition and secure his first Art Ross Trophy, he would become the just the second Oiler in franchise history to win the title. Wayne Gretzky (obviously) is the other. He won the Art Ross a record 10 times, including seven years in a row from 1980-1987. Ironically, it was a Pittsburgh Penguin (Mario Lemieux) who ended his streak. Considering all the greats that have suited up for the Oilers over the years, it’s surprising that only Gretzky has managed to win an Art Ross. It would put the young McDavid in exclusive company. Back in the summer, the Hockey News predicted that McDavid would win the scoring title, and so far they’re right. They had him finishing with 96 points, one ahead of Crosby. It could pan out that way, because despite the quality of the competition, McDavid continues to rack up the points and stay ahead of the pack. Winning an individual award is never the end-goal. Winning the Stanley Cup is all that matters. But every player wants to be the best, and a scoring title in his second season would be step one on the road to what will undoubtedly be a remarkable career.